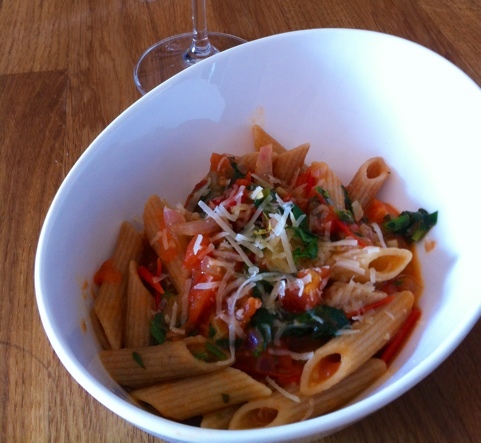 Nothing is better than an easy delicious pasta recipe on a lazy Sunday. 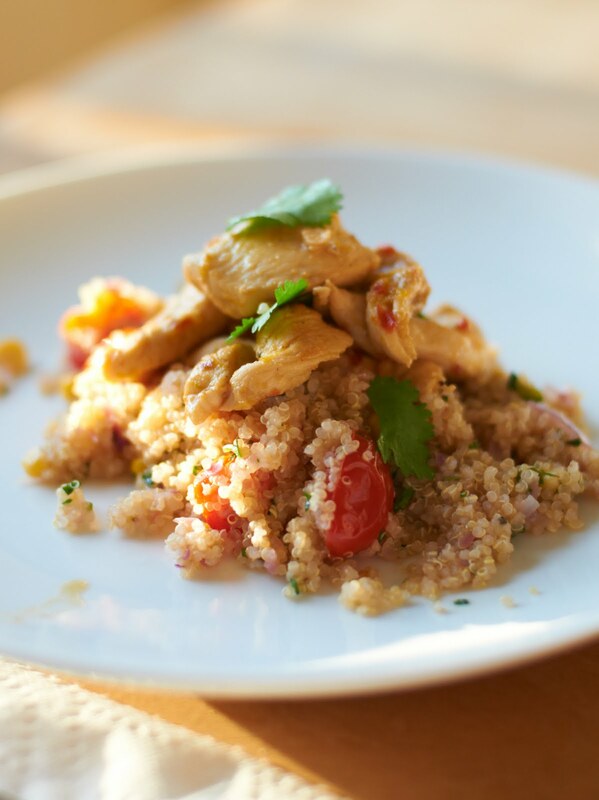 This recipe has so much flavor, yet was so simple to throw together! I really enjoyed cooking like this, it amassed a few pots and pans but each item can easily cook in it’s own pot, no stress, and then at the end you mix it all together and it was really all just meant to be. We tossed the tomatoes in the oven while water came to a boil for the peas and pasta on the stove. That left time to dice up the bacon and brown it. 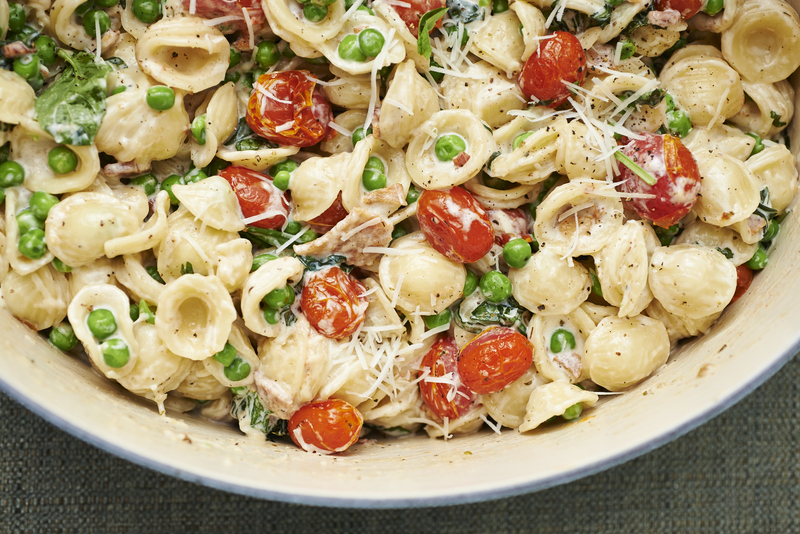 Cook the pasta, blanch the peas, thicken the sauce, remove tomatoes, and toss it all together. The original recipe was a little heavier on the cheese, heavy cream and bacon fat, so we altered it to be “lighter” although I wouldn’t say this is the healthiest dish to make. 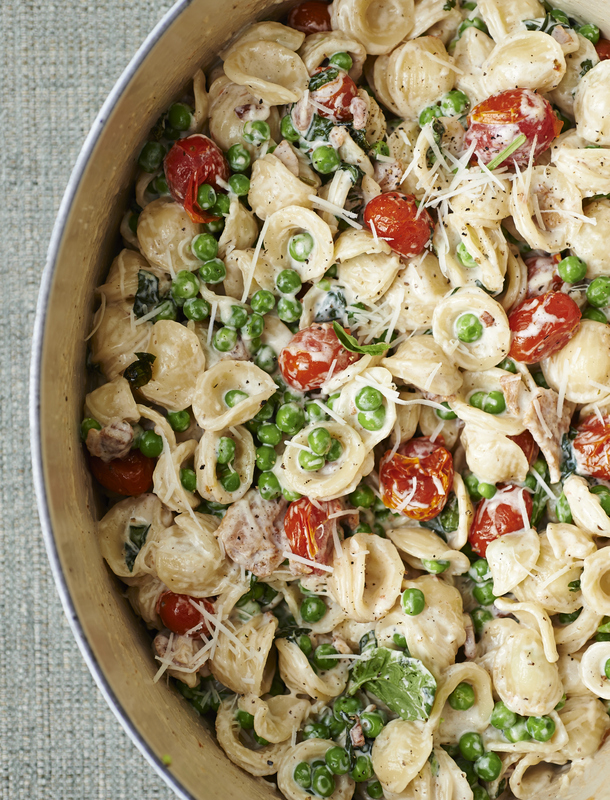 We love the bright peas and basil along with the roasted tomatoes and creamy sauce over those cute Orecchiette noodles ( mini turtle shells!). Easy, flavorful, veggieful, creamy perfection- enjoy! 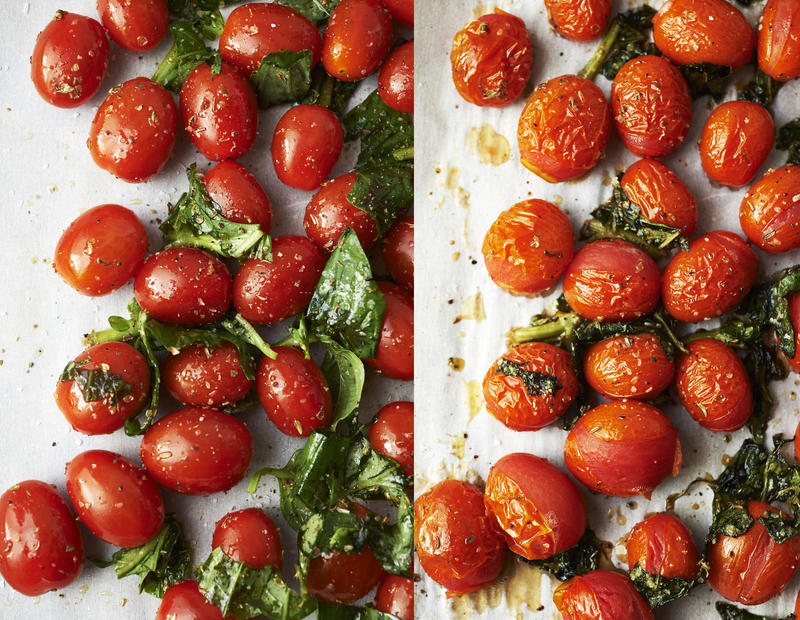 On a jelly roll pan lined with parchment toss the tomatoes, a drizzle of olive oil, salt, pepper, 1/2 the basil ( torn) and oregano. Roast for about 15 minutes or until the tomatoes are blistered. Bring a medium saucepan of water to a boil. 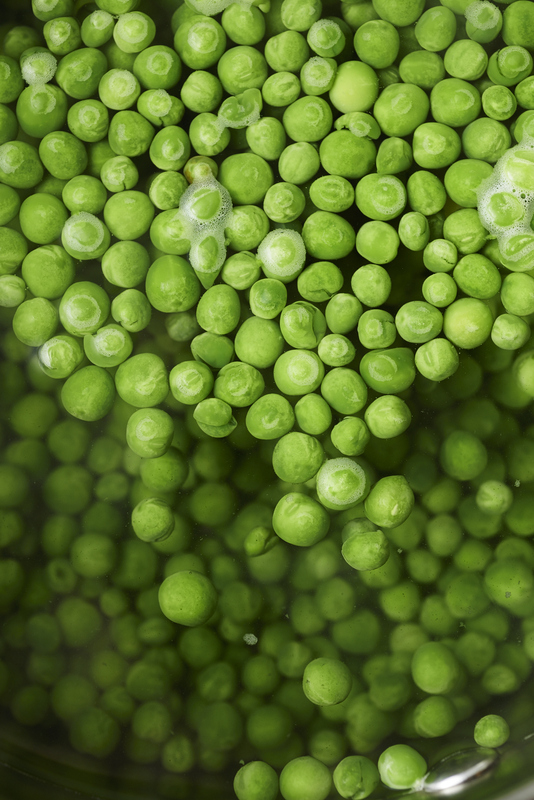 Blanch the peas for 3-4 minutes. Drain. 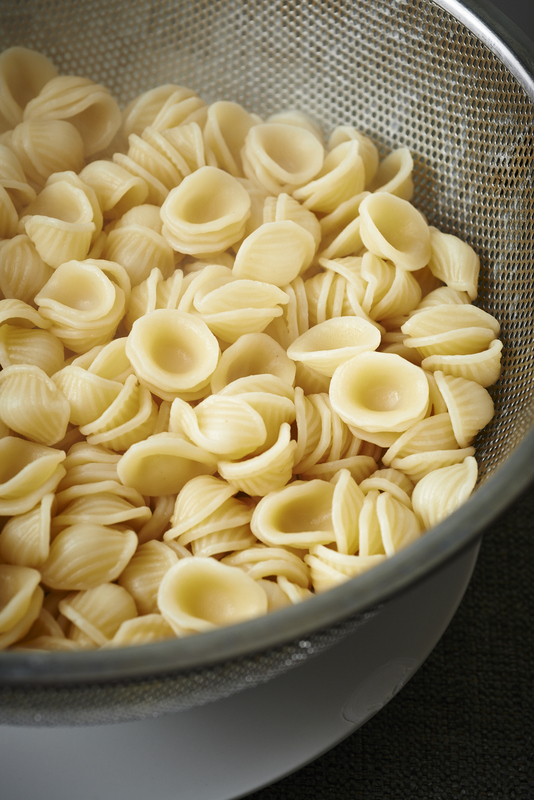 Bring a large stock pot of salted water to a boil, cook your pasta until al dente. Drain and set aside. While your pasta is cooking, heat a drizzle of olive oil in dutch oven style pot over medium high heat. Cook the bacon until crispy. Using a slotted spoon, remove the bacon to a paper towel lined plate and drain most of the bacon fat out of the pot. Pour in the cream, milk and bacon and stir to coat. Add the Pecorino Cheese, a little bit of salt and a nice hit of freshly ground black pepper. (Be careful to not over salt) Reduce the heat to low and cook for about 10-12 minutes until the sauce is reduced and coated the spoon. Add Orrechiette and Peas to the sauce. Add your roasted tomatoes on top, and the remaining basil ( a little more Pecorino grated) Taste to adjust seasoning, add more pepper or salt to taste. 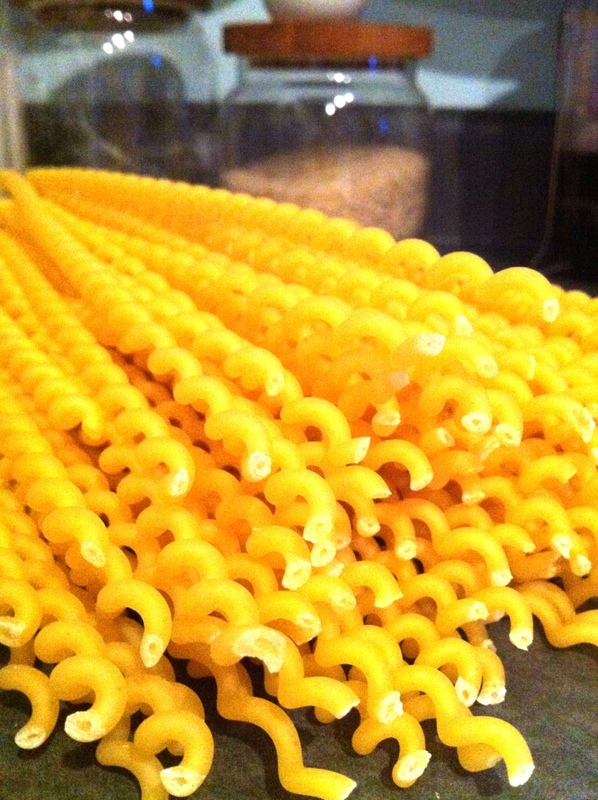 Let’s talk pasta. Versatile, filling, satisfying- pasta. 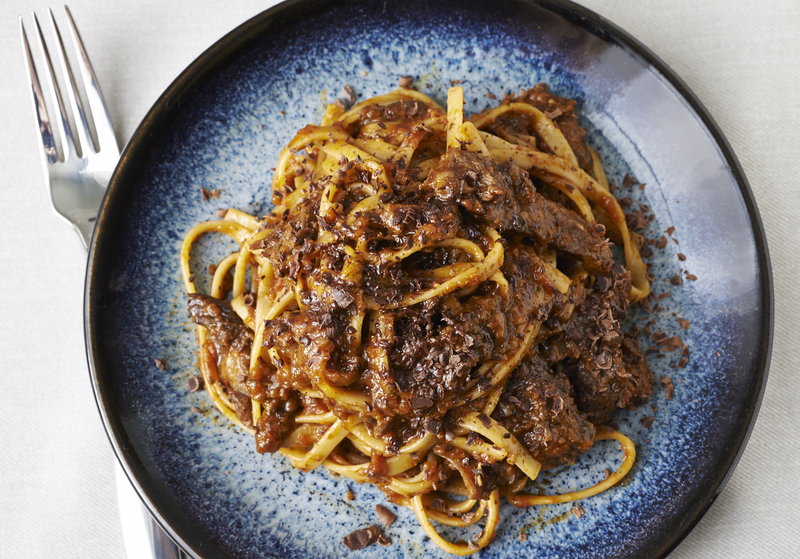 But this is not your ordinary pasta dish, this is something special. It’s so special that I really hope you will make because it’s almost impossible to describe it’s amazingness in this post. 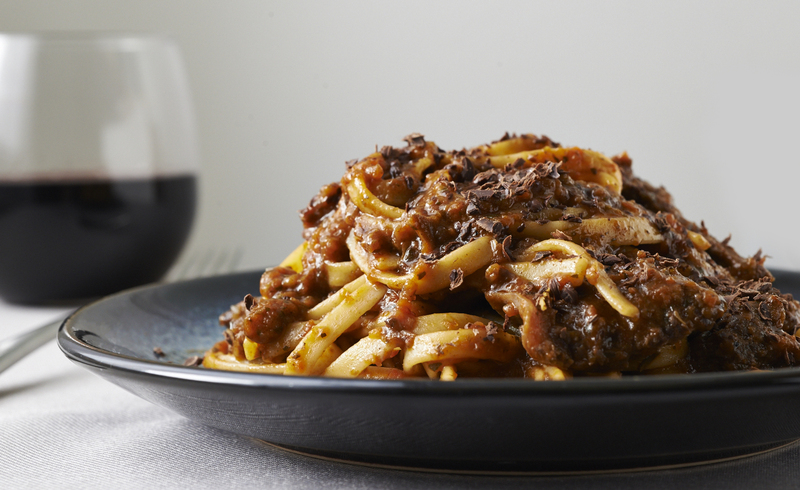 It’s the best meat sauce we have ever had- Bolognese- step aside- a new sauce is in town. This recipe does take time to cook, but it is so simple to make so do not be intimidated. Coming from the gal who loves a good marinara with fresh basil and mozzarella, I would trade up for this short rib sauce any day. Jason’s been on a short rib kick, it’s been great, we’ve made this recipe, and then he ordered a Braised Short Rib Sugo dish at Homestead during restaurant week, and he was so blown away that we decided to try to re-create it at home. We’re nerds like that. 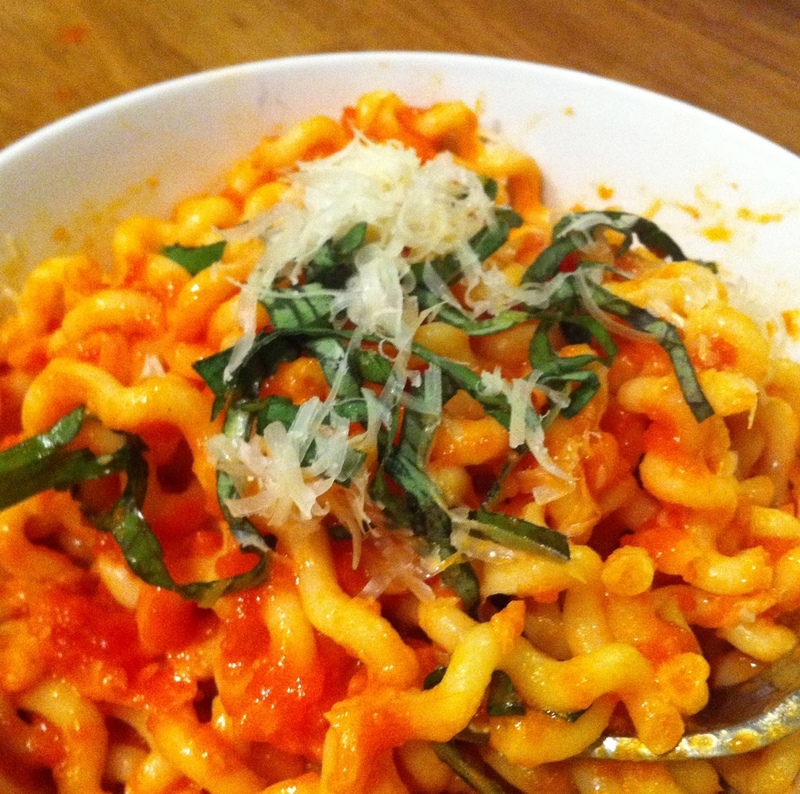 So happens that Jason found the perfect recipe, from none other than Giada herself. A few tweaks from our kitchen to make it even easier and we had perfection. The chocolate shavings on top to finish the dish are imperative, weirdly necessary and so perfect paired with this meal in a bowl or on a plate. Please make this recipe and be blown away like we were. Short ribs are super affordable cuts of meat, and when cooked correctly like in this, they are transformed. Let’s hope this broth based, veggie filled, meat sauce is the trick to kicking this cold I got to enjoy all weekend… I’ll let you know how that goes, in the meantime you go and Enjoy, cook, create, eat and Enjoy!! Place the olive oil in a large heavy soup pot over medium heat. Cook the bacon until golden and crisp, about 4 minutes. Meanwhile, season the short ribs with salt and pepper, and dredge in the flour. Using a slotted spoon, remove the bacon from the pan to a paper towel lined plate and set aside. Add the short ribs to the pan and brown on all sides, about 7 minutes total. Meanwhile, combine the onion, carrot, parsley and garlic in a food processor and blend until finely minced. Then add the tomatoes and tomato paste and pulse. Once the short ribs are browned, carefully add the mixture from the food processor to the pot. Return the bacon to the pot and stir. Add the rosemary, thyme, oregano, beef broth, and wine. Bring the mixture to a boil. Reduce the heat and simmer, covered, for 1 hour and 45 minutes. Remove the lid and simmer for another 1 hour and 45 minutes, stirring occasionally. Remove the meat and bones from the pot. Discard the bones. Shred the meat and return it to the pot. Season with 3/4 teaspoon salt and 3/4 teaspoon pepper, or to taste. Bring a large pot of salted water to a boil over high heat. Add the pasta and cook until tender but still firm to the bite, stirring occasionally, about 8 to 10 minutes. Drain the pasta, reserving 1 cup of the cooking liquid. Add the pasta to the pot and stir to combine. Add the reserved pasta liquid 1/4 cup at a time, if needed, to moisten the pasta. Transfer to serving bowls, top each bowl with 1 teaspoon of chocolate shavings. Serve immediately. Put the tomatoes, onion and butter in a heavy saucepan- 3-quart, over medium heat. Bring the sauce to a simmer then lower the heat to keep the sauce at a slow, steady simmer for about 45 minutes, or until droplets of fat float free of the tomatoes. Stir occasionally. 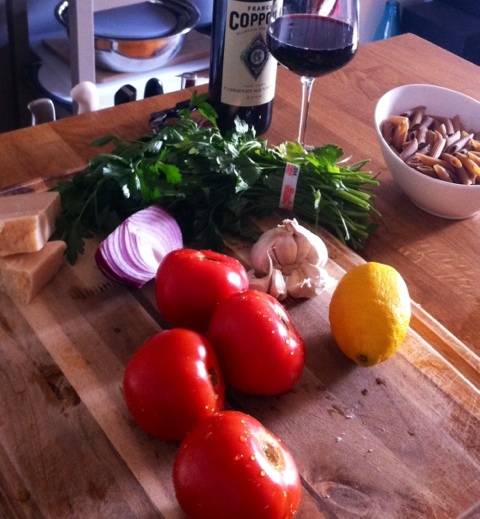 Remove from heat, discard the onion, add salt to taste and keep warm while you prepare your pasta. This morning was one of those amazing fall days in Chicago, the kind we all reflect back to when the snow and slush and icy winds start to bring us down. After an admittedly challenging couple of weeks, there is so much change in the air, not only the seasons. In times like these it’s important to remember that our lives are only as good as the choices we make, whether they are good choices, hard choices, wrong choices; they all shape who we are, who we will become and the life we will have. Inspired by two friends today, I took a long break to get outside and bike+ run, not just to work out but to slow down, think, walk, and soak in the great day. Everyone I passed was smiling, the sun was shining, the lake rippled in the wind and colorful leaves rustled along my path, the skyline gleamed in the contrast of the blue skies, it was as if everywhere I looked, a gorgeous photo presented itself. It got me thinking about how charmed our lives are, if we can just take a moment to step back and enjoy it. If the choices we make define who we are, we should make each one count; they should enrich our life, they should inspire us, they should make us happy- it’s our choice, right? In lou of all the changes a new season brings, our family is faced with all kinds of challenges and choices, our near future of where we will end up is hovering within reach and it’s overwhelming. It’s helpful to reflect, jot stuff down and just take a moment to put things in perspective. This is life, it is glorious, we have the ability to make choices and that is pretty great. Put the onion, garlic, ginger, curry powder and cayenne pepper into the bowl of a food and process until combined. Add the oil and process until a smooth puree. 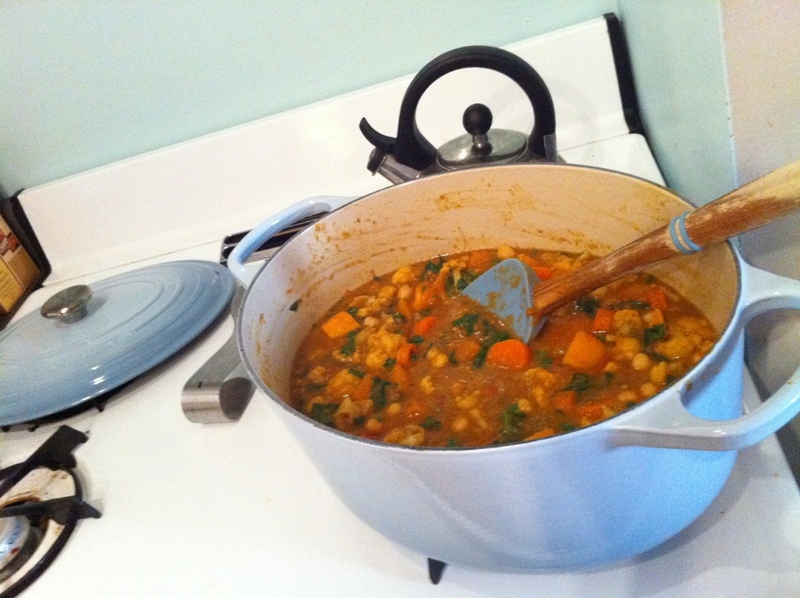 Cook the curry puree in a large pot over a medium heat, stirring frequently, for 5 minutes. Stir in the tomato paste and continue cooking, stirring frequently, until the mixture begins to darken, about 5 minutes more. Add the vegetable broth, coconut milk, cinnamon, salt and pepper and bring to a boil. Reduce the heat and simmer for 10 minutes. Add the cauliflower, sweet potato, carrot, tomatoes, salt and pepper and return to a boil. Reduce the heat to medium-low, cover and simmer until the vegetables are tender, about 25 minutes. Remove the cinnamon stick. Stir in the lime zest and juice, the garbanzo beans and the spinach and cook for 5 minutes more, until the spinach is wilted. Season with additional salt to taste. Serve garnished with cilantro, over rice if desired. Copyright 2011 Ellie Krieger. All Rights Reserved. Preheat oven to 450 degrees. On a rimmed baking pan, toss asparagus spears in a drizzle of olive oil, sprinkle with salt and pepper. On a separate baking sheet, toss pita pieces with a drizzle of olive oil, sprinkle with salt and pepper. Place both sheets in the oven and bake for 5 minutes. Remove the asparagus from the oven, give the pita chips a toss but continue to cook for an additional 3-5 minutes until slightly browned. Let pitas cool ( and turn your oven off- this heat! whew) Meanwhile, squeeze some lemon juice and sprinkle nutmeg over your cooked asparagus, toss together, then transfer to a cutting board and chip in to 1″ or bite sized pieces. 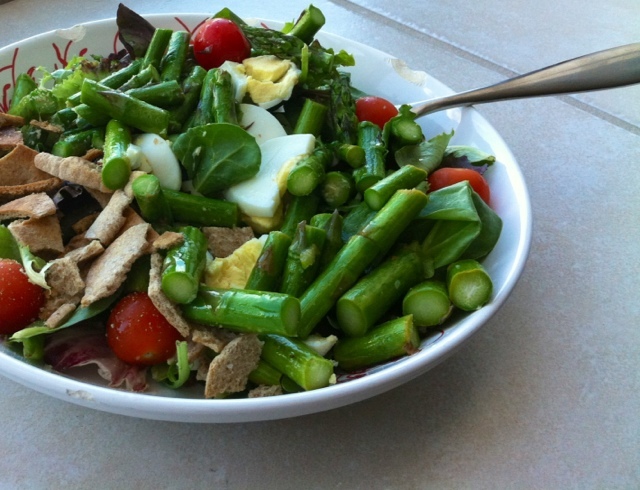 Then in your favorite salad bowl, I recommend one with some sides, add your mixed greens, then add the tomatoes, chopped hard-boiled egg, asparagus pieces, and pita pieces, drizzle with more olive oil, a squeeze of lemon and salt and pepper to taste. This may be pretty dorky, but- don’t you just LOVE when you can throw a bunch of random stuff together… that you’ve got hanging around the kitchen…. and make it in to a really really good meal? Well, we are dorks because we certainly do, enjoy it- literally! Obviously you won’t make this recipe having the exact same happenstance of ingredients on hand… unless you made fish tacos Sunday, Quinoa Cakes Saturday, and are planning to make Wild Rice with Pistachio and Oranges ( coming soon!). The inspiration, other then what we had to use, came from a craving for Chinese Orange Chicken- but no desire for the unhappy belly afterwards. In a 10-12″ pan, heat oil over medium heat till hot. Add onion, cook for 3-4 minutes till translucent and fragrant. Add in the corn, cabbage, cilantro, tomatoes and stir to combine, 2 minutes. Add in 1/2 cup wine and reduce by half. Add in the quinoa, toss well, adding in marinade, orange juices and water to coat the mixture. If it’s too dry, add more water. Heat through, about 3 minutes longer. Taste and adjust seasonings with salt and pepper. To cook the chicken, heat another 8-10″ pan over medium high heat with a small dash of oil. When the pan is hot, add in all the marinade and chicken from your bowl. Cook tossing often for about 7-8 minutes, till juices run clear and chicken is cooked through completely. 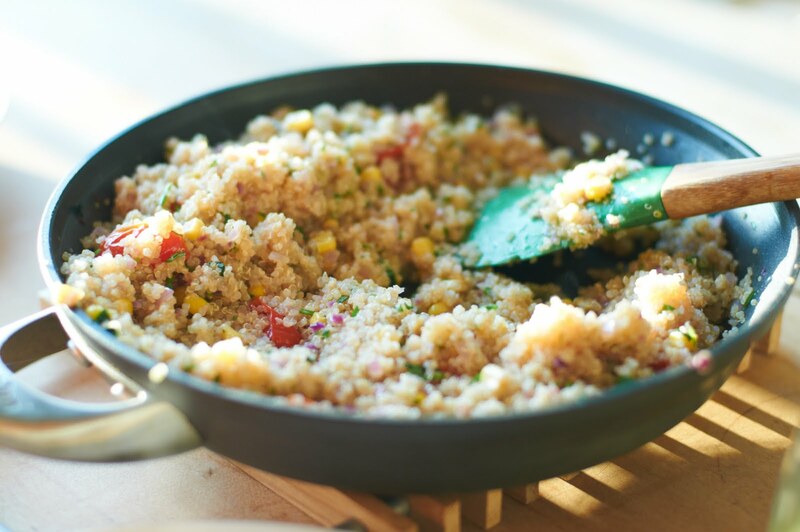 Serve on a bed of Quinoa and top with extra cilantro.